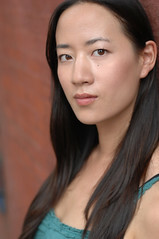 Joyce Wu grew up in the suburbs of Detroit. She wrote, directed and produced her first stage play at the age of 20. It premiered at the Oxford Playhouse’s Burton Taylor Studio while she was studying English Literature at the University of Oxford in England. To support herself as a struggling artist, she worked a variety of odd jobs including a stint as a counter person in a chocolate shop, a clerk in the rare books department at the legendary Strand bookstore, a typist for a 97 year-old blind playwright, a personal assistant to a renowned perfumer known as “The Nose” and as a fashion and beauty model. She is an actress with film and television credits and has appeared in numerous plays in theaters all over New York. She was awarded a Maurice Kanbar Institute fellowship and a scholarship from the Academy of Motion Picture Arts and Sciences to pursue her master’s degree in Film Production from New York University’s prestigious Graduate Film program, whose alumni include such directors as Martin Scorsese, Joel Coen, Ang Lee, Spike Lee, Amy Heckerling among numerous others who have contributed to American independent cinema. The first season of her web series Mr. Right is available to view and her first feature film She Lights Up Well was acquired by American Express for its Amex Now app on Roku boxes and Smart TVs and has screened at several festivals and universities and at the United Nations. It is currently available on iTunes and Verizon VOD.